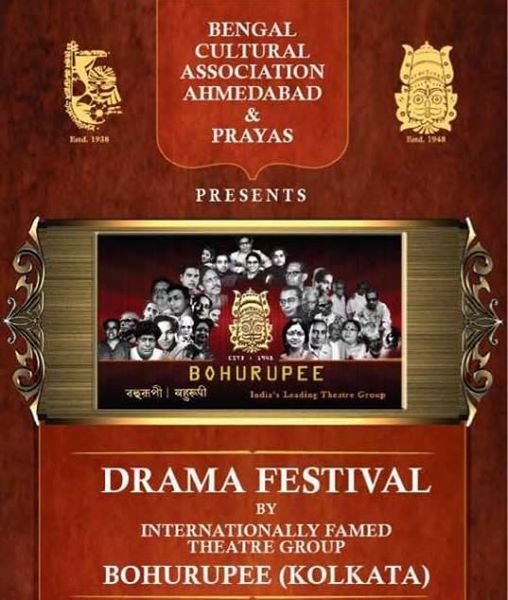 Bengal Cultural Association-Ahmedabad and Prayas takes pleasure in organising a 2 day Bengali Theatre Festival by INTERNATIONALLY FAMED Theatre Group “BOHURUPEE” (Kolkata) for the first time in Ahmedabad at PT. DEENDAYAL UPADHYAY HALL, AHMEDABAD. BOHURUPEE will stage PHULLAKETUR PALA on Day-1 and MEDAL on Day-2. Both the plays are highly acclaimed and much praised by the audiences all over India. No doubt, this will be a great chance for the culturally inclined Bengali population of Ahmedabad to have a glimpse of current mainstream plays of Kolkata which we usually miss. Expect the best time this weekend. !